After that, I dabbled in many arts and crafts, and there aren’t many I haven’t tried. In high school I did paper sculpture and macrame. In college, I started as a theater major with an emphasis in costume design. I decided, though, that I didn’t like sewing enough to want to do it all the time. I had imagined, quite wrongly, that costume designers had staff that did all the sewing. Maybe in big costume shops, but most costume designers do their own. So I switched my minor to be my major and my major to be my minor and became an art major. I got my Bachelors of Art in art with an emphasis in watercolor at Western Michigan University. Before that, my husband and I had married while we were both still in school, and the idea was that once we finished our degrees, he would teach and I would paint. It didn’t work out that way. I got my degree first, but he was still working on his so I had to get a full-time job to have money coming in so he could finish. I put off my plans to paint for a year while he finished. My husband’s first teaching job was in Illinois and started in the middle of the year, which did not allow him to spread his pay over the summer. We moved and got an apartment. He started his job. I started my painting career, but homesickness, lack of inspiration (it was so flat there! ), and loneliness took it’s toll. I took to going to the grocery store just to talk to someone during the day. When summer came, we had no money coming in, so I had to get a full-time job. After that, it was just one thing after another. I still painted but not very often. By the time we had moved back to Michigan where his second teaching job was, I was finding as much satisfaction doing different crafts as I could, including cross-stitch and knitting. I did some weaving. Then we bought a house and had children. Painting got pushed off further into the future. I found card making at a MOPS (Mothers of Preschoolers) meeting where someone had brought in rubber stamps for us to stamp on card stock, color with colored pencils, and make Christmas cards. “Wow!” I thought, “I could save so much money on Christmas cards and have fun too.” Famous last words. I somehow never saved any money on my Christmas cards. But it’s still fun! I’ve gone on to enjoy scrapbooking, making gift packaging, and making home decor projects, but making cards is really my main thing right now. I spent some years as a Stampin’ Up! demonstrator, from 2003 to 2015. I have enjoyed helping people learn about stamping through my blog since 2006. I started out on Blogger, moved my blog to Typepad, and now I have moved it yet again to WordPress. I hope you enjoy what I have to offer and will subscribe! Recently, I started drawing and painting again. I’ve discovered that I really can draw! I think I had convinced myself that I wasn’t all that good at it, I guess as a way of keeping me from feeling like I was wasting my talent. Funny old brain. To see my paintings and drawings, visit my art gallery page. To contact me, visit my contact form page. For information on privacy, visit my privacy page. Do you take commissions for art work? Yes, I do! You can contact me through my contact form. 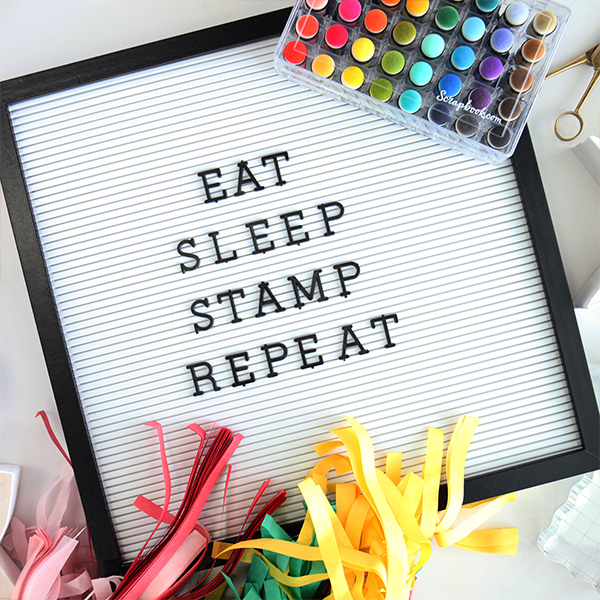 Are you a Stampin’ Up! demonstrator? No, I used to be, but I no longer am a demonstrator for Stampin’ Up! I had a wonderful experience, made wonderful friends, and have great respect for the company and its products. Where did you get the social media stamp I see in your photographs? I got the stamp you see in my card photos from Bossy Joscie, aka Joscie Cutchens. I highly recommend her stamps and have not just the social media stamp that you see in my photos but also one for stamping on the back of my cards along with others. She does a great job! Do you sell your retired or unwanted stamps? Yes, I do periodically sell off the stamps I no longer use on Ebay. My Ebay account is InkwithTink. Do you get all your stuff from companies for free? I wish! I pay for everything I use unless I say otherwise. Why JanTink? What happened to Stamps, Paper, Scissors? I have been JanTink since I first got on AOL and it rejected my other choices for user names. Starting with listserves like the KnitList and internet forums, I have been JanTink ever since. So when I bought my domain long ago, I naturally decided to take jantink.com. When I decided to redo my blog, I wanted to use my domain name as the name of my website. What are affiliate links, and why should I purchase through them? Many bloggers participate in affiliate programs. In exchange for linking to websites that sell the products we use, those programs give us a small percentage of the sales that are made through those links. It doesn’t cost you anything more than what you would usually pay, and it helps me to buy more products, which lets me show you how to use them, and you get more enjoyment out of them. It’s the circle of life for a papercrafting blogger, really a win/win situation for you, me, and the companies that make the products. I’m a blogger too! What affliate company do you participate through? Most of my affiliated companies work with shareasale.com except for Ellen Hutson LLC, who has their own program through a different company.